As if it weren’t hard enough to fight cancer as a kid, childhood cancer survivors are at a higher risk of developing physical and emotional difficulties once their treatment is complete. We learn more about these challenges and how professionals at Penn State Children’s Hospital navigate them from Dr. Smita Dandekar, director of the Pediatric Cancer Survivorship Clinic, and Amanda Musser, Four Diamonds social worker. Description – The video begins inside Penn State Children’s hospital. Three people are standing next to each other inside an infusion room. From left to right is, Scott Gilbert, Dr. Smita Dandekar and Amanda Musser. Scott Gilbert – From Penn State Children’s Hospital, this is ”Ask Us Anything About Life After Childhood Cancer”. I’m Scott Gilbert. As if it weren’t hard enough to fight cancer as a kid, childhood cancer survivors are at a higher risk of developing physical and emotional difficulties once their treatment is complete. We’re going to learn more about these challenges and how professionals here at Penn State Children’s Hospital navigate them from a couple of important folks here. Doctor Smita Dandekar, she is Director of the Pediatric Cancer Survivorship Clinic here. And, also, Amanda Musser, she’s a Four Diamonds social worker, here, in this clinic. Thanks to both of you for being here today. So, let’s start by talking about the systems and parts of the body that are affected most by these types of side effects. Because, as we mentioned, we’re talking about both physical and emotional aspects. Right. Dr. Dandekar – Sure. And it’s truly unique for every patient because everyone’s cancer is different. The organ that it involves is different. And so, the toxicities that can come from the therapy are different. So, in our clinic it’s truly, we truly look at every patient as a distinct individual and look at their own therapies. Scott Gilbert – What are some of the most common parts of the body that are affected by these side effects? And what are the types of treatment that cause them? Are we talking about radiation, chemo, maybe both? Dr. Dandekar – Yeah. So, some of the chemotherapies, like a group of medicines called anthracyclines, can sometimes affect the heart and cause some cardiac toxicity. Radiation, depending on which organ the radiation was given to, especially, if there was radiation given to the chest, it can affect the heart, the lungs. And, hence, we will, then, tailor the testing that we do to the organs that could have been affected. If you’ve had something like Wilms tumor where your one kidney was removed, you are left with one kidney. And then if, say, if you’ve gotten radiation to that area, as well. So, then there are some certain things that we want to look at. Fertility is something that’s really important for our young adult survivors. And, especially, by the time they come to survivorship clinic they’re often young adults. So, a common thing that we will, we often ask about is what are the chances of me having a child down the line? So, these are, like, some of the things that we, normally, see. But, we also have a neuropsychologist in our clinic, who. And Amanda, who is trained in mental health. And their job is, essentially, to look at the emotional well-being. Scott Gilbert – So, that’s what you spend a lot of your time on, I imagine, Amanda? The emotional side. Amanda Musser – It is. So, there’s a lot of new research in childhood cancer survivorship that shows that post traumatic stress disorder is a very real phenomena of the, when they come in to our clinic after the fact. So, we really try to focus on making sure that they’re adjusting okay, they’re doing well emotionally. Depression, anxiety, fear of recurrence is very common. So, we’re constantly assessing for all of those things when they come into the clinic. Scott Gilbert – So, these are things that, you know, while a child may be, quote, cured of their cancer, I know we use that word very sparingly. There are effects that linger, including that fear that it could come back any day. Amanda Musser – Yeah. And I always try to educate. Cancer is not a disease that goes away when treatment is done. It’s definitely something that follows you for your lifetime, for the continuum. And, you know, we want to make sure that they are living the best life they can possibly live. Despite having these challenges from the treatment that they received when they were younger. Scott Gilbert – You’re watching ”Ask Us Anything About Life After Childhood Cancer” from Penn State Health and Penn State Children’s Hospital. I’m Scott Gilbert, alongside Doctor Smita Dandekar and Amanda Musser. They welcome your questions if you’d like to put them in the comment field below this Facebook post. Whether you’re watching this live with us here on Monday or if you’re watching after the fact, we can get you some answers to questions that you might have about this topic. Another question I have is about the fact that, you know, you mentioned that these side effects. There are, obviously, side effects that surface. We hear about some of the most common ones. For example, chemotherapy may cause you to lose your hair. But, these are side effects that can surface years, ten, 15, or more years after the fact. Dr. Dandekar – Right. So, about two thirds of the cancer survivors will have at least one late affect, we say. And about quarter of the patients, some of them could be like life-threatening. So, which is why it’s very important to follow them over time. And some of the late effects, you’re right, can be apparent as long as like, ten, 20 years down the line, especially, the ones that affect the heart. So, which is why even we say that you are ready to leave our clinic and graduate. Because that’s a big part of our program. Like empowering them with education and then, say now you can follow with your PCP. But, we give them a clear picture of what other things we want them to do. Like, get an echo every five years, which a PCP can do. And we send a summary to their doctors to say, hey, it’s ready for the patient. The patient is ready to transition out of our clinic, but these are some things that we would like to do because surveillance is truly lifelong. Scott Gilbert – Doctor Dandekar and Amanda, as I mentioned, are both part of the Childhood Cancer Survivorship program, here at Penn State Children’s Hospital. So, this is, Amanda, this is a rather unusual program. There aren’t many like it across the country. Amanda Musser – There aren’t. There’s only a handful of survivorship clinics across the country. And we’re fortunate enough to have, have one here in Hershey, Pennsylvania. So, it’s, it’s really special that we’re able to offer this support for our patients for many years after their treatment. And the other nice thing about our program is that our clinic is rather small for academic centers, which allows us to really get to know our patients. Every year when they come in, we are, look forward to seeing them. And there’s many nurses, too, that have been working here since, you know, for a very long time that look forward to seeing the survivors come in, now that they’re grown, adults, doing well. And it’s very exciting for us to be able to still be a part of their lives. Scott Gilbert – On a related note, looks like Lauren has a question. She’s asking, how many patients do you follow here in the clinic at a given time? Dr. Dandekar – Yeah. So, we have about 300 patients that we follow that have been seen in our clinic. And the clinic was started in 2009. So, slowly we’ve built over time. And I took over the directorship in 2013. And at that point we had around 50, 60 patients. So, it’s truly in the last four to five years that we’ve really expanded and we’ve involved other people like neuropsychology and genetics and we’ve made it into a major disciplinary program. Scott Gilbert – Great. And, you know, as we know, Four Diamonds is a very important mechanism, here, through which families and, you know, patients are helped throughout the course of treatment. That’s no exception when it comes to this type of survivorship care. Amanda Musser – Yeah. So, Four Diamonds, once you’re a Four Diamonds patient you’re always a Four Diamonds patient, which we really try to reiterate when they come into our clinic. We are always there for them, up until they turn 100, which we hope that they do, someday. But, the Four Diamonds, and specifically mini-THON, does fund our clinic. And we, also, make sure that none of our patients receive any medical bills from their survivorship visits and tests that go along with those visits, too. And, even, though they only see us once a year, we are always there for them throughout the entire year for any kind of support services that are needed and that kind of thing. Scott Gilbert – So, if as you’re watching this you’re wondering where do those mini-THON dollars and my children help to raise at school go? This is another great example of the Pediatric Survivorship Clinic here at Penn State Children’s Hospital. Again, you’re watching ”Ask Us Anything About Life After Childhood Cancer” from Penn State Health. Doctor Dandekar and Amanda Musser welcome your questions, so feel free to add them to the comment field below this post. So, how individualized does the monitoring and treatment approach need to be? Doctor Dandekar, you mentioned earlier that, pretty much, every case is different, right? Dr. Dandekar – Yeah. Absolutely. Because one patient may have leukemia. The other one could have had a brain tumor. The third patient could have had a tumor in, say, his kidney or adrenal gland. So, everyone’s cancer is different. The therapy they receive to cure that cancer is different. Some get chemotherapy, only. Some get chemo and radiation. Some get chemo, radiation, and surgery. Some have a transplant. So, what we do is we combine all the treatment exposures they’ve had and then, we give them guidance about what are the things we need to look out for. Scott Gilbert – Right. And from all of that I guess you get the survivorship roadmap, as it’s called on the clinic website. Right. Dr. Dandekar – Yeah. We do. And our nurse, Rowena [assumed spelling], puts a lot of time into those plans. She sits down and looks at all of the different medications, posts all the records out. Sometimes, it’s very hard to do, depending on how long ago they were treated. Life before computers, sometimes. And really gets those organized for us and shares them with the patients, so that they have the education for when they are ready to transition back to their family doctor. Scott Gilbert – So, the one question on my mind is, it must be tough for parents and patients to grasp the concept that, that a treatment that will, hopefully, ultimately cure someone of cancer comes with so many side effects. You know. It’s just such a double-edged sword, there. So, how, you know, how do you talk people through that aspect? Dr. Dandekar – So, what the way I tell families is, say, about 40, 50 years ago, four out of five kids with cancer would die. Now, we’re at a point where four out of five kids with cancer are cured. And that’s, that’s a great place to be in. But, with that comes a tremendous responsibility to make sure that we are following them for life, because we want to them to live 80, 90, 100 years. So, actually, parents are very receptive and they are very thankful. Because it’s just a, it’s a plan of surveillance. It’s not anything invasive. It’s not giving them new medications, unless they need to. See if they have some cardiac toxicity and have to start a medication for their heart. It’s only going to help them live longer. So, parents are. I mean, our experience has been that parents are, usually, very receptive and want to know what’s going on with their child and how to keep them healthy. Amanda Musser – Yeah. And, and as always, in medicine, you know, prevention is key. So, if we can see them before they get to the point where, you know, they’re not doing as well from some of the side effects, we can prevent them from having issues in the future, too. Scott Gilbert – And, ultimately, this also seems to point to the need to find better cures. It’s great to have cures, but research continues, including right here in Hershey, Pennsylvania, for better cures. And that’s funded by Four Diamonds, too. Dr. Dandekar – Absolutely. I mean, Four Diamonds, we are so indebted to Four Diamonds. The THONs, the mini-THONs. Everything that the kids do. And, I mean, we have a very robust research program, over here. And that would not have been possible without Four Diamonds. They fund our experimental therapeutics program. A lot of the people that we have in our own like multidisciplinary clinic are funded by Four Diamonds. Like our cancer geneticist that’s here, as well as our neuropsychologist. We wouldn’t have them if it weren’t for Four Diamonds. So, we are very thankful to Four Diamonds. Scott Gilbert – Very good. Fantastic. 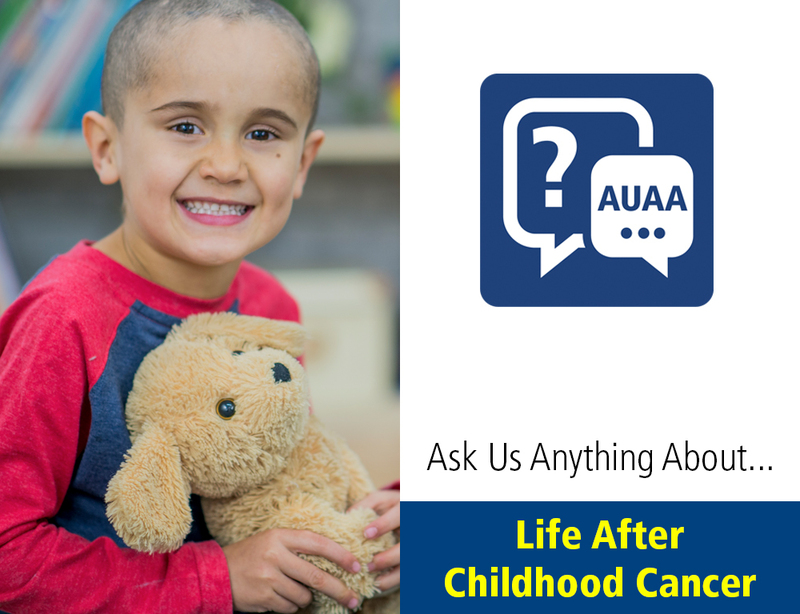 Again, you’re watching ”Ask Us Anything About Life After Childhood Cancer” from Penn State Health. As we wrap up here with Dr. Smita Dandekar and Amanda Musser, we welcome your questions and your comments in the Facebook, in the comment field below this Facebook post. Whether you’re watching it live or if you’re watching it on playback. You know, we, I’ve heard a lot about the psychosocial component to cancer treatment. And how going through this process can make children feel distant from their peers because they’ve had to endure something that they didn’t. Amanda Musser – Yeah. Yeah. And we talk a lot about that in clinic when, when the kids come in, how they’re feeling. If they feel, you know, normal compared to their other children in their class. And most of the kids really adjust very well. Children are so resilient. And one of the beautiful things about working with the kids is that when they are here in the hospital receiving chemo treatment. A majority of the time they’re very happy, playful, making friends with all of the staff members here. And, sometimes, they believe that’s because they don’t quite understand that they’re supposed to be feeling sick. So, when they come back to clinic, when I ask them if they have any negative memories from when they were treated, getting pokes, that sort of thing. Most of them, usually, identify fun things such as eating chocolate ice cream or spraying the nurses with water guns. So, they really don’t have a lot of issues adjusting, which is great. I think it’s the parents, usually, that have a harder time than the children, to be honest. Scott Gilbert – Very interesting. Well, thank you both for your time, today. I know people can go online to the Children’s Hospital website and look for the Pediatric Cancer Survivorship Clinic. We’ll also share that link below this Facebook post here, too, so people can learn more. But, thanks very much to both of you for your time. Dr. Dandekar and Amanda Musser – Thank you for having us. Scott Gilbert – One more time, Doctor Smita Dandekar is Director of the Pediatric Cancer Survivorship clinic and Amanda Musser is a Four Diamonds social worker here, at the Children’s Hospital. Thanks, so much, for watching ”Ask Us Anything About Life After Childhood Cancer” from Penn State Health.